Sometimes in life, you reach a point where it’s time for an upgrade. Whether it’s a new computer or that landscaping lawnmower you’ve been eyeing all summer, an improvement can be a wonderful thing. This methodology also applies to cars, so it’s time you ask yourself if it’s time to upgrade to the 2018 Chrysler 300. Since it has several great features and sound specifications, it could be the perfect choice. If you’re a picky person, the Chrysler 300 is the ideal car for you. With five unique trim levels, you can choose the one that’s right for you. The base trim is the Chrysler 300 Touring, which features a punchy V-6 engine and eight-speed automatic transmission. It also comes equipped with the popular Uconnect infotainment system on a sizable 8.4-inch display. Multistage air bags, rear backup camera, and electronic stability control all come standard. As you work through the trims, you’ll unlock other great features, such as parking assistance, blind spot monitoring, and remote start capabilities. The two highest trim levels are equipped with a more powerful V-8 engine. The 2018 Chrysler 300 features a spacious and luxurious interior with plenty of extra features to help anyone enjoy their morning commute. The front legroom is just about standard for the class, while rear passengers have more legroom than other vehicles. Heated front seats are standard, so a long drive in cold winter climates is no problem at all. As you step up a few trim levels, you’ll discover heated rear seats, an optional panoramic sunroof, and dark mocha leather upholstered seats. These kinds of extra features make the 2018 Chrysler 300 a great choice for an upgrade. You’ll find plenty of storage opportunities inside the 2018 Chrysler 300. Depending on whether or not you fold down the rear seating, the 300 can hold between six and 16 pieces of carry-on luggage. These statistics lead the class. Many large sedans have the option to fold the rear seats, but having a 40/60 folding option is a nice touch. The lower trim levels are equipped with a V-6 engine that puts out around 300 horsepower. The 300 Limited and 300C trims, however, have an upgraded V-8 engine for 363 total horsepower. The 2018 Chrysler 300 is the ultimate stylish commuter car. It is near the top of its class when it comes to highway fuel efficiency, with an estimated 30 mpg. The estimated city mileage is on the lower end of the spectrum, though. Looking at the 300, you can see that it makes a great option for an upgrade choice. Its bold exterior pairs perfectly with a well-designed, spacious and luxurious interior. If you’re still unsure about which car is right for you, or you’d like to consider another vehicle, be sure to head down to the dealership or see our current inventory. 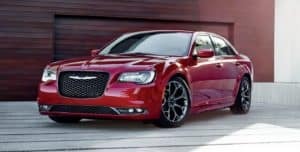 0 comment(s) so far on Is It Time to Upgrade to a 2018 Chrysler 300?